It's always a pleasant surprise when food magazines arrive in the mail. And it's hard to resist the urge to try some recipe from it. That's the feeling we had when the October 2009 Cooking Light arrived at our home. 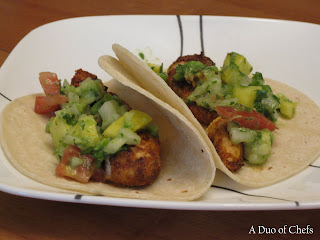 And inside, we found a recipe for fabulous Chicken Tacos with Mango-Avocado Salsa. First, combine garlic powder, paprika, onion powder, ground red pepper and salt in a bowl and mix it over the chicken, which we cut down to small strips. 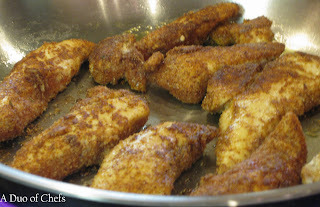 Then cook them in a nonstick skillet over medium-high heat. 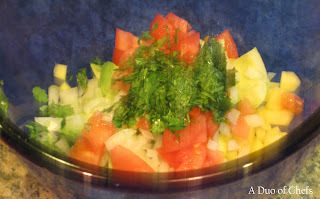 In a separate bowl, combine the mango, avocado, tomato, onion, cilantro, lime juice and jalapeno pepper. Then just layer the chicken in corn tortillas and pile on some of that amazing mango-avocado salsa. I admit it. I'm a fool for avocado. If it's listed in a recipe, it's nearly a shoo-in for me to like the finished product. And the creaminess definitely came out in the recipe. The mango -- we cook with the fruit about, oh, never -- was a bit underripe, so that flavor didn't come out as much, but was still very good. And the chicken had a nice bite of heat to it, and it wasn't overpowering, either. 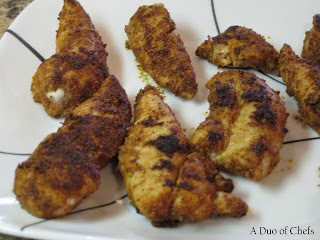 This was a great workday meal that took a little bit of prep time, and not much cook time. Omg. I am getting so hungry reading this post. I'm not the biggest avocado fan, but I'm always open to trying new things.